The price on this neat little mirrorless camera has dropped to its best-ever price overnight, and now ranks as one of the best Christmas camera deals we have seen this week, and a perfect last-minute gift idea for the would-be photographer, or for someone who wants a smaller camera for travelling. The Fujifilm X-A5 comes in the discrete silver and black and finish, and is supplied with a Fujinon XC 15-45 mm f/3.5-5.6 OIS PZ kit lens. The deal is found at Amazonand at John Lewis. You pay £349 for the camera kit - but thanks to the current Fujifilm cashback offer you will be able to claim back £45 of this direct back from the manufacturer. So you get this camera deal for just £304... which is a great post-Black-Friday price for this 24 megapixel compact system camera with its flip-up 3-inch screen, and built-in wifi capability. 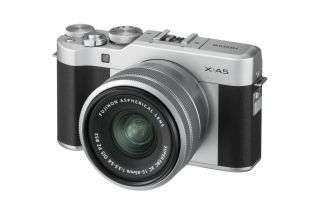 The X-A5 was announced back in January, so is still very much a current model in the Fujifilm X-Series line-up. We are not sure how long this offer will last - so don't wait too long if you are interested.